Whether it is at trial or in sensitive settlement negotiations, you can have peace of mind having an experienced, knowledgeable attorney like me in your corner. Born and raised in Dover, I am committed to providing every client with the same respect I give to family, friends and neighbors. I understand how scary the legal system can seem to many people. As my client, you will receive the one-on-one attention from me that you will need. I will take all the time that is necessary to address your questions and concerns while learning about your goals and needs. My goal will be to help you pursue a resolution that protects your best interests and legal rights and helps you move on with your life in a positive way. 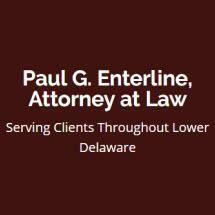 If you would like to learn more about how I can help you, contact Paul G. Enterline, Attorney at Law, at 302-396-9555 to schedule a free consultation at my office in Georgetown, Delaware.